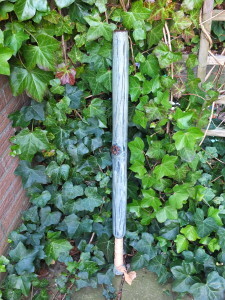 You may have heard that a +1 club is just a baseball bat, but Pieter from Arcana has built a nice one. 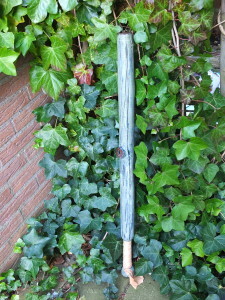 It’s about 80 cm long, here are some pics! 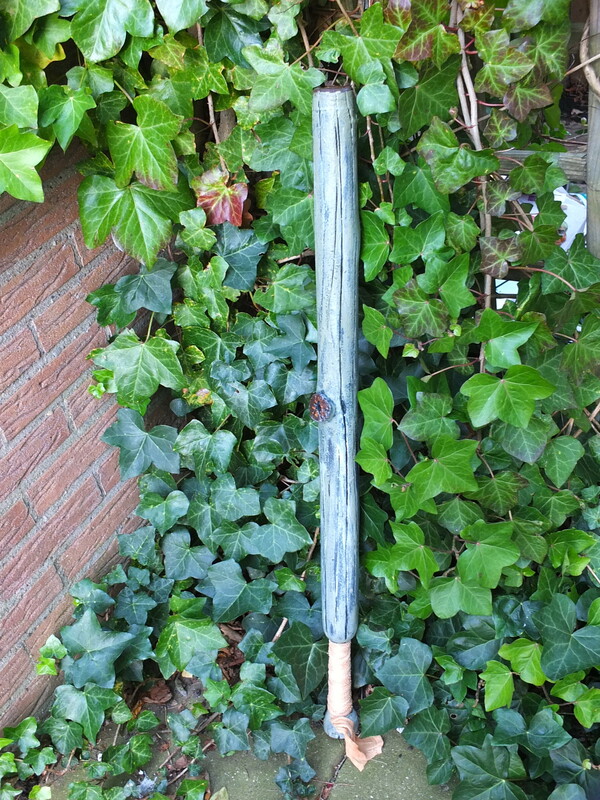 Pieter from Arcana shared some pics of a knife (about 40cm long) made using foam, latex, and plastidip. Very realistic! 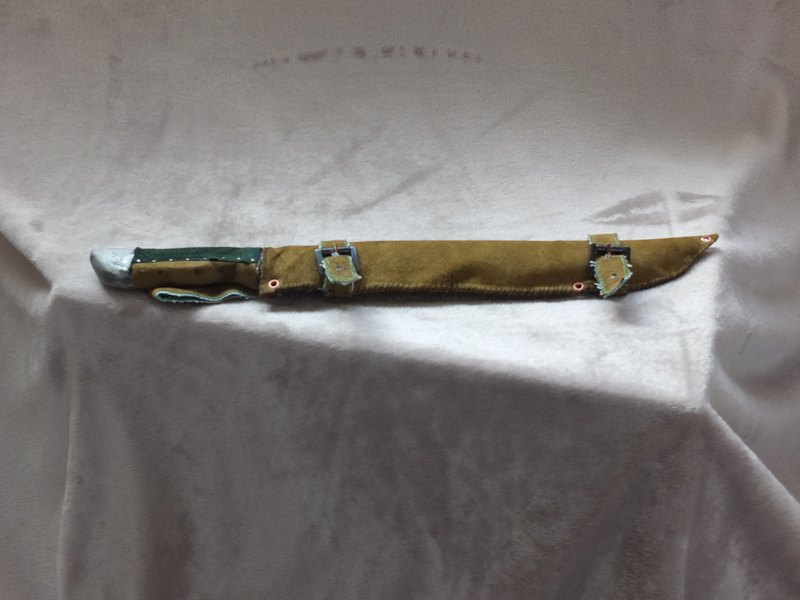 It even has a custom sheath. Just wanted to point out Anoc of Wrapshot’s no-gimmick one-handed sword build is just as good a guide as it was when it was first posted. Now, unless you’re local to Darkon, you’re not going to be able to pick up his MC foam blade kits, but Forged Foam still sells their own well-regarded foam blades. 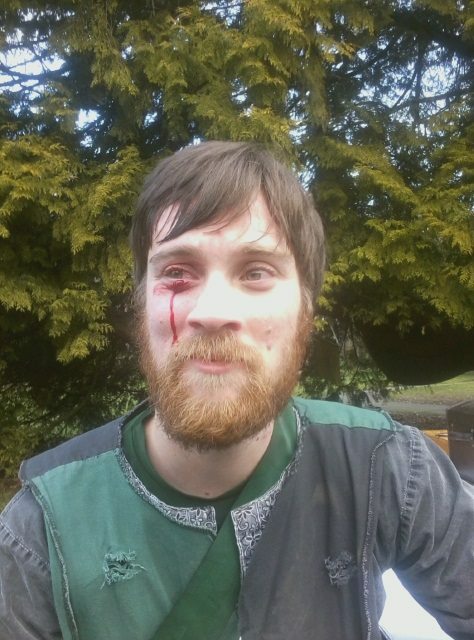 A friend of mine asked me if I could help him with an axe he wanted to build. 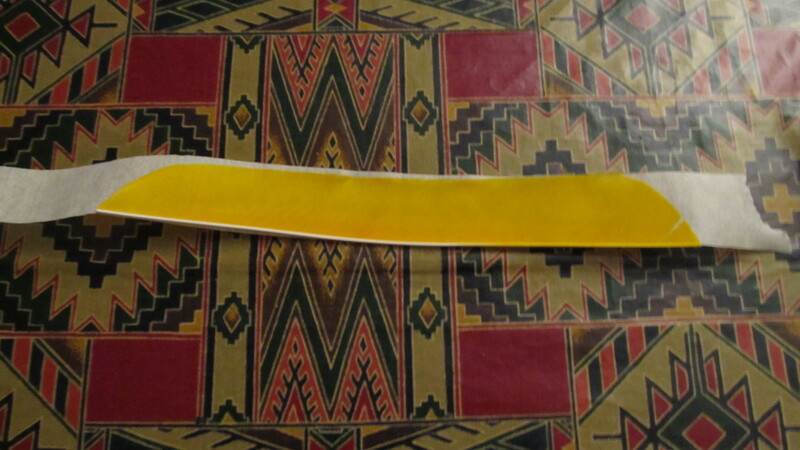 Dimensions: 110 cm (3 feet 7 inch) and double bladed. In the drawing you can see that the internals are drawn as well. It is better to plan ahead! Making the parts. Knowing what goes on beforehand is a tricky part and varied from weapon to weapon, but pretend it’s real and imagine yourself a blacksmith. The frame is made-up clued together kite spare covered in cloth. The cloth is glued and stitched. Glued together and cut to size. Note the barbs where left out because it was felt that it would weaken the weapon. 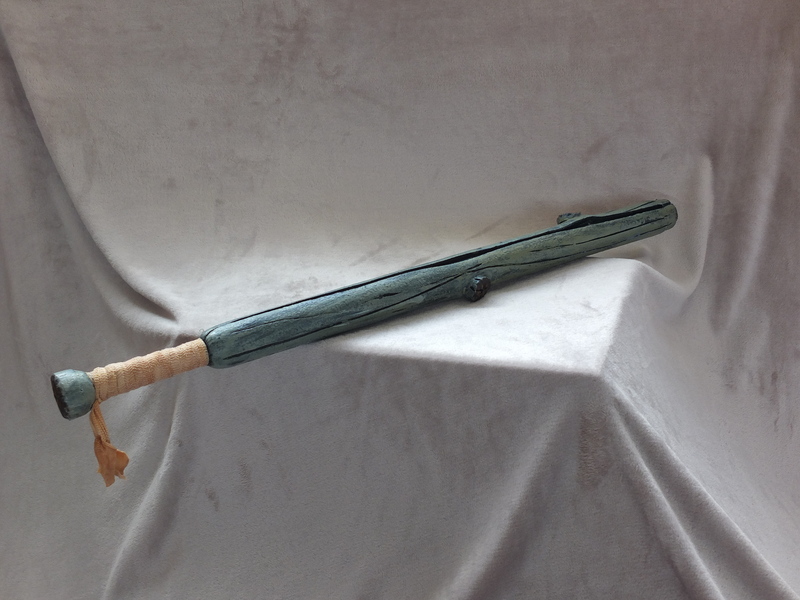 The handle is made from wood and crafted so it will take two AAA batteries. The switch is placed at the backend of the weapon and foam protected. Than the red, and metallic are directly airbrushed on to the latex. Covered with a coat of plastidip clear and finished with a light coat of clear varnish. On arrows or crossbow bolts, the fletching is used to make the pointy bit of the arrow hit the target first. 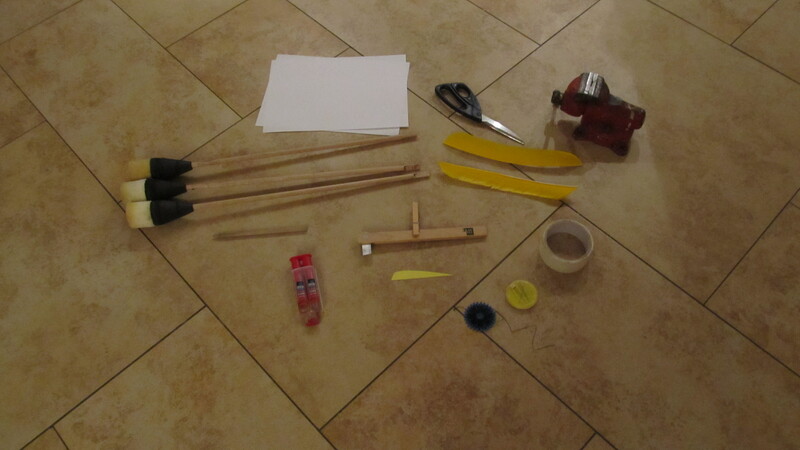 Without fletching an arrow won’t fly straight and could hit a target sideways, but with LARP arrows having such big heavy heads, they will actually turn midair and hit the target with the backend. 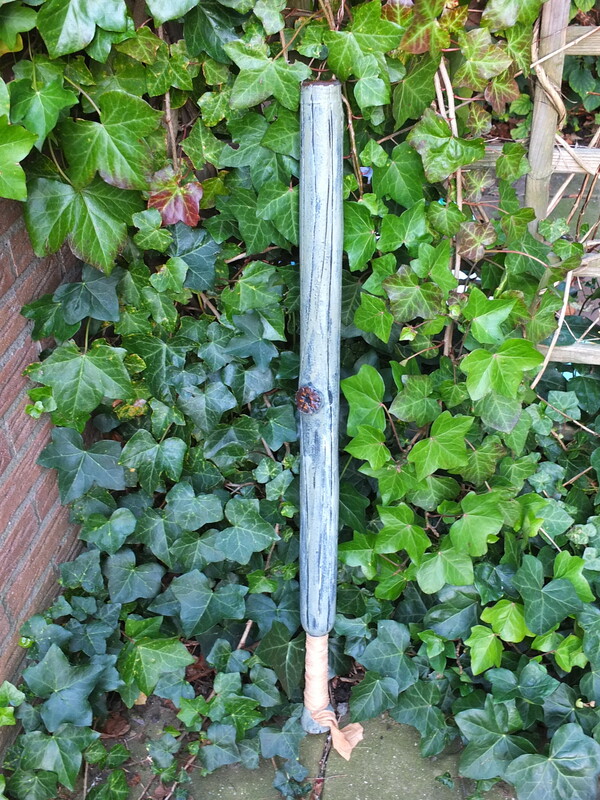 So arrows need fletchings, and LARP arrows really need big fletchings. 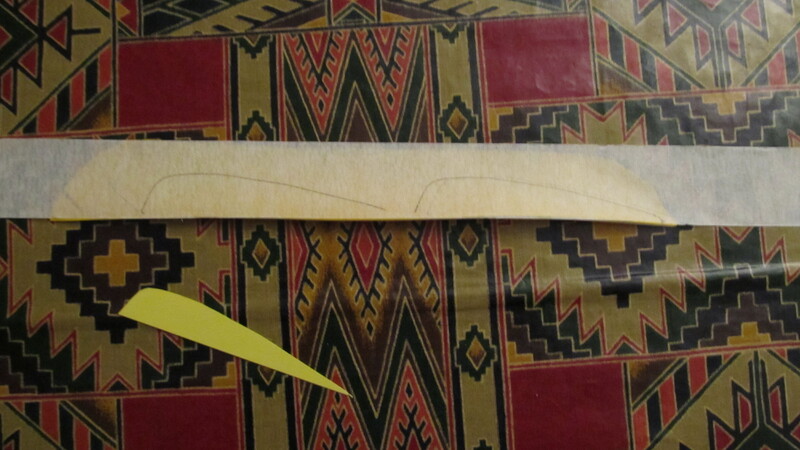 You will need to make a template because you need to make two very similar feather each side of your arrow. If they are to uneven the arrow will veer off in one direction. You can make a template out of paper, cardboard or plastic. 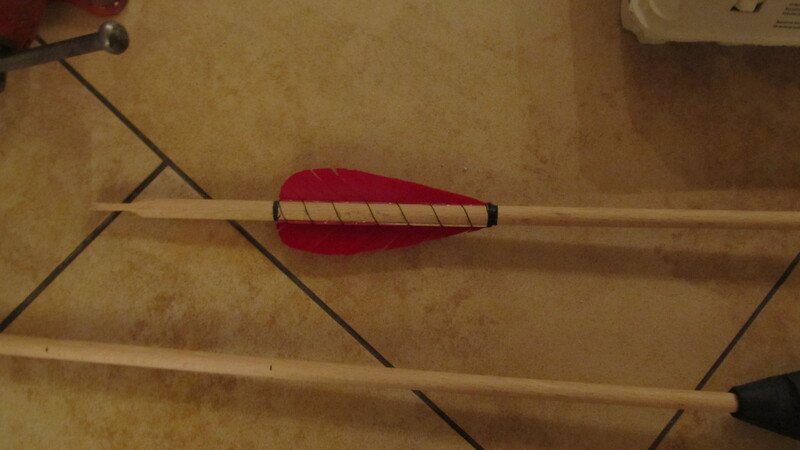 I make my fletchings slightly longer than the cross-section of the arrow head. 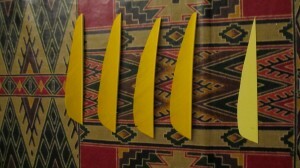 The height of the fletching isn’t so tall that it sticks past the arrow head. 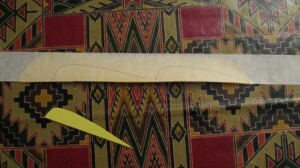 The cross-section of the arrowhead is a minimum of 5 cm, so the length of the fletching is about 6 or 7 cm. 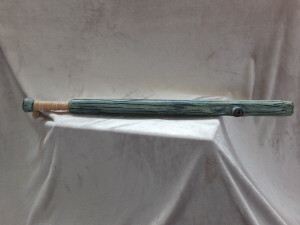 The height is 0.5 * 5cm – 9 mm (half the cross-section minus the diameter of the shaft) so about 2 cm. 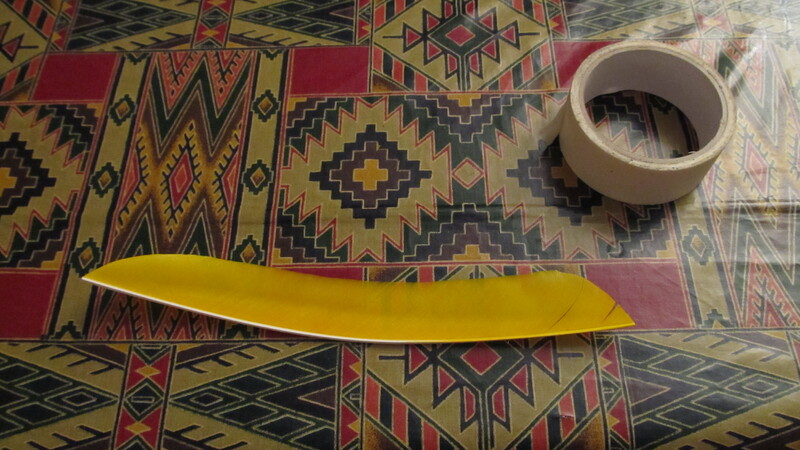 Stick some masking tape on the feather. This will make the drawing and cutting easer. 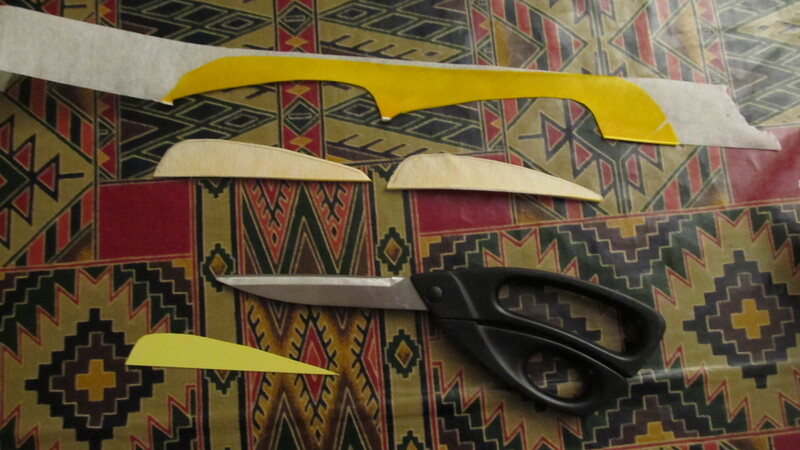 Put the template on the masking tape, draw and the cut with some scissors, remove the masking tape. First mark out where you want to have the feathers. You do this by using a pencil and laying the arrow on a flat service and run the pencil along the shaft. Do this both sides (bolts only have two feathers) and flip the arrow and do this again. You should end up with two pairs of parallel lines on both sides of the shaft. 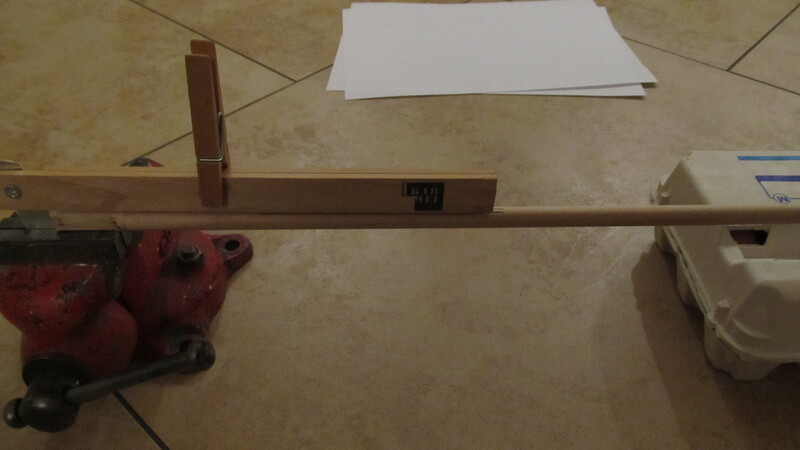 I use a gluing aide and a vise. 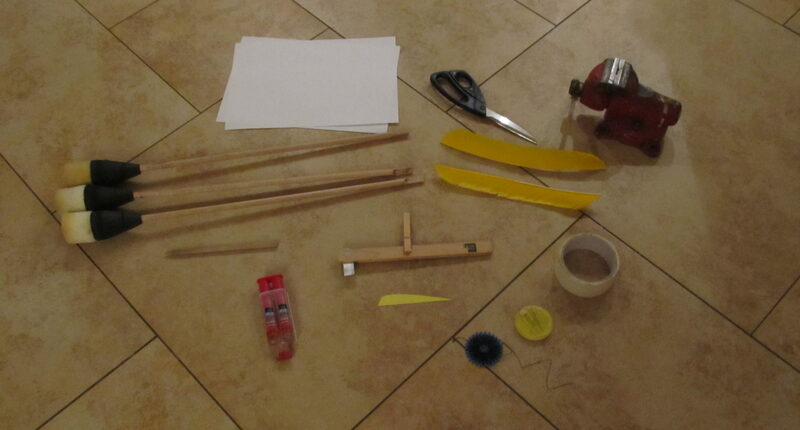 The gluing aide is to hold the feather when glue is setting. And a vise to hold the arrow nice and steady. The aide is made of two pieces of wood a cloth pick. Just to keep the feather straight. I use two more clothes picks to hold this to the shaft. Repeat on the other side. 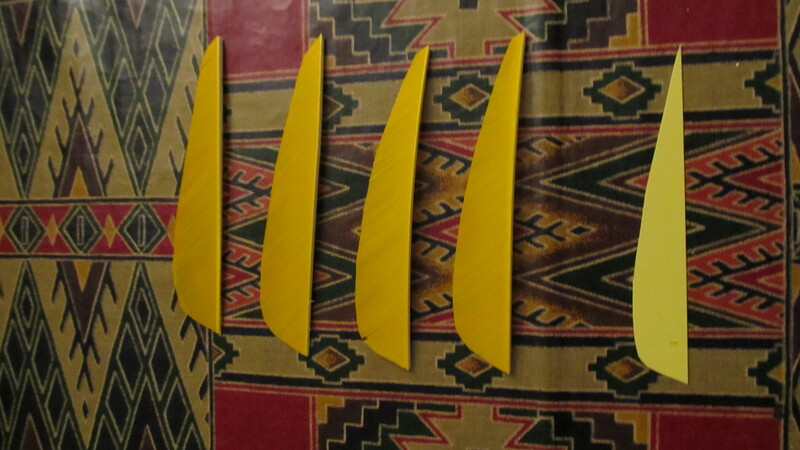 When you have glued the flights. 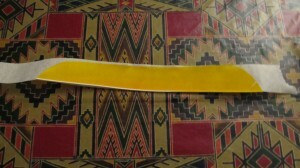 Then you apply the binding. 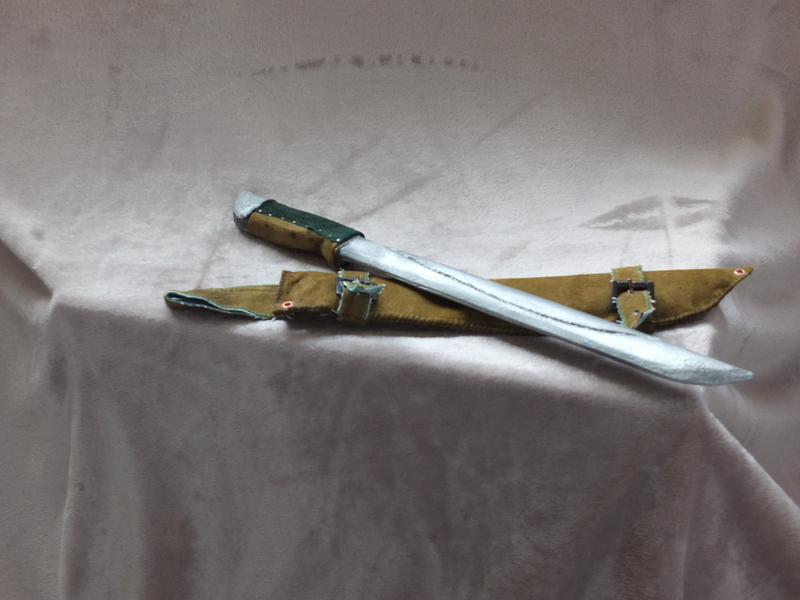 The binding service a decorative purpose and a structural one. Start with a simple knot and wind tightly towards the feather. Then use the needle to part the filaments, get the thread right in low at the base of the filament. If done correctly, the feather should close. If it doesn’t, then probably the thread isn’t low enough, just redo it tighter. At the end just wind tightly and a few knots and some glue to stop the thread form unwinding. 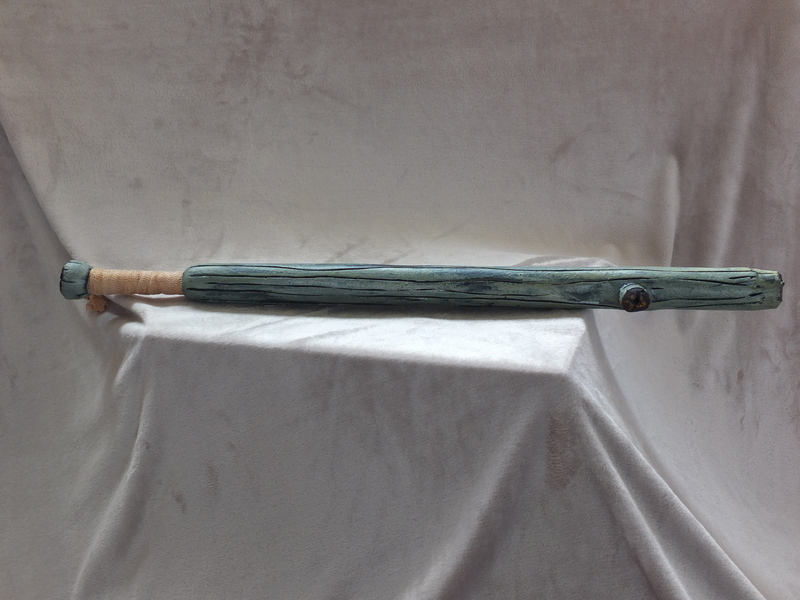 And now you have a fletched bolt.